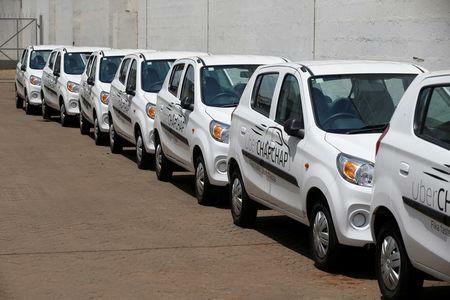 NAIROBI (Reuters) - At Suzuki Motor Corp's <7269.T> showroom in the Kenyan capital, hundreds of its Alto compact cars are waiting to be collected. Most of the customers are drivers for ride-hailing company Uber Technologies [UBER.UL], which struck a loans and discount deal with the Japanese carmaker and South Africa's Stanbic Bank , at the beginning of the year. General Motors Co has invested in U.S. ride services firm Lyft and Toyota is also backing Uber. Japan's SoftBank Group Corp <9984.T> is also an investor in Uber and Southeast Asia's ride-sharing app Grab. Five blocks from CMC in Nairobi, at Toyota Motor Corp's <7203.T> showroom light trucks and bikes are waiting for buyers. Some of these are drivers for Sendy, a local online delivery company. Like Uber, its drivers own their vehicles. Germany's Volkswagen AG , invested $50 million in a plant in Rwanda this year to assemble its Polo, Passat and Terramont models. It also set up a ride-hailing app called VW Mobility Solutions as no other service is available there yet.